The institution will begin its functions with some 1. 2 billion dollars to support the productive projects of young Venezuelans. May 3 (teleSUR) The president of Venezuela, Nicolás Maduro, announced on Thursday the creation of a digital cryptocurrency bank for youth and students, which will begin its activities with 20 million Petros, a national cryptocurrency. The president said that the contribution given to the new institution to begin its functions with close to 1.2 billion dollars, which will support the productive initiatives of this sector of the population. 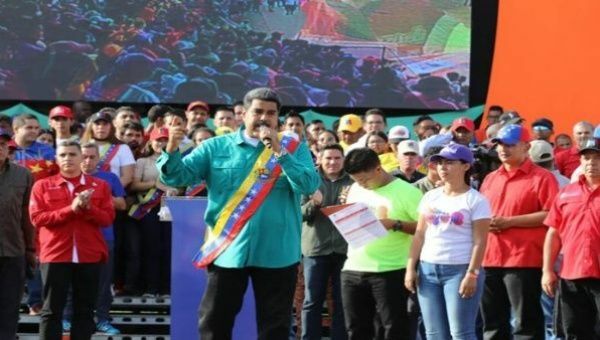 The information was given by the president during a mass ceremony in the state of Aragua with young people who make up the Chamba Juvenil Plan, a social program that promotes the first job among the youth of the country. Also, the head of state reported the approval of resources to continue with the deployment carried out by the members of the aforementioned plan and indicated that 150 young professionals were incorporated into the Venezuelan economic structure. On the other hand, he stressed the importance of each university and lyceum having a ‘farm’ for the mining of cryptocurrencies to continue with the strengthening of the national economy. Together with members of the ministerial cabinet, the president celebrated that one million young people are now part of the Chamba Juvenil Plan and expects that half a million more will be added in the coming months through the Carnet de la Patria, a mechanism that allows the population to receive directly the benefits offered by the revolutionary government.